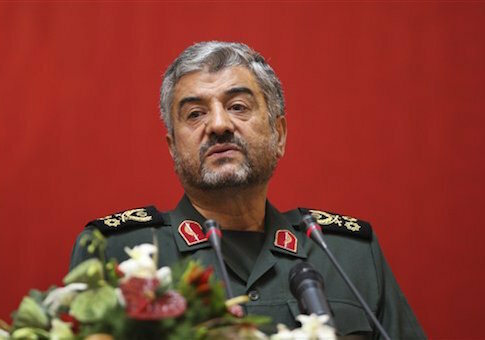 A senior Iranian military leader is claiming that the United States has conceded ground on a range of Iran’s so-called nuclear redlines just weeks after agreement between the two sides sparked debates and disagreements in Washington, D.C., and Tehran. General Mohammad Ali Jafari, the commander of Iran’s Revolutionary Guard Corps (IRGC), referred to the United States as "the enemy" and said major ground has been given up by the Obama administration as negotiations continue through June. "Some solutions have been found and it seems the Islamic Republic’s principles and red lines in technical aspects have been accepted on the side of the enemy," Jafari was quoted as saying by the Iranian state-controlled Press TV. Major disagreements remain between the two sides and could kill negotiations before a final deal is reached, he said. "However, there are still ambiguities regarding the manner of sanctions removal, which should be clarified," Jafari said, noting that this sticking point "could lead to disagreement too." The IRGC commander’s comments continue a war of words between the United States and Iran over what exactly was agreed to during the most recent round of negotiations in Lausanne, Switzerland. While both sides initially hailed a framework agreement as a historic step toward a final deal, the pact broke down just hours after being signed. Iran maintains that the United States has agreed to allow all nuclear sites to remain operational and that no military sites would be subject to inspections upon the signing of a final deal. The Islamic Republic also claims that economic sanctions on Tehran will be immediately lifted if a deal is struck. However, the Obama administration disagrees with this description. It claims that Iran would stop most of its most contested nuclear work and that sanctions will only be lifted in a gradual manner. Much of the disagreement revolves around a fact sheet issued by the White House immediately after the framework agreement was reached. Iran has described this document as a "lie" and said it in no way agreed to any of the conditions outlined. Secretary of State John Kerry admitted that each side has put its own "spin" on the agreement during an interview Sunday on Face the Nation. "I would remind you, we had this same dueling narratives, discrepancy, spin, whatever you want to call it with respect to the interim agreement," Kerry said. Kerry went on to claim that the Islamic Republic would uphold any deal that is struck. "Iran has proven that it will join into an agreement and then live by the agreement, and so that is important as we come into the final two and a half months of negotiation," he said. Kerry, who will brief members of Congress about the deal on Monday and Tuesday, said critics of the Obama administration’s diplomacy with Iran should remain silent. "I think people need to hold their fire, let us negotiate without interference, and be able to complete the job over the course of the next two and a half months," he said. Meanwhile, one of Iran’s top negotiators on Sunday urged the United States to show "goodwill" and to stop fighting against Iranian demands. "The solutions have been specified in the Lausanne negotiations and we hope that the other side will not throw the wrench during the future negotiations, and rather pave the ground for reaching a comprehensive agreement by showing good will," Iranian Deputy Foreign Minister and senior negotiator Majid Takht Ravanchi was quoted as saying by the Fars New Agency. Critics of the framework deal said the ongoing debate over what was agreed upon shows the Iranians cannot be trusted to live up to any guarantees made in a final deal. "It's entirely possible that both sides are lying about what the Iranians were willing to concede, but that's not the point," said one senior official with a Jewish organization that is familiar with the negotiations and concerns on Capitol Hill. "If the Obama administration is actually truthful, then it means the Iranians are already backsliding on what they've agreed." "That's not new, and in fact it's how they always negotiate. They take what they can get and walk away," the source added. "But that's exactly why you don't make deals with these guys. Instead we're talking about letting them have billions of dollars in sanctions relief, which they'll use to supercharge their terror and military campaigns, and waiting until they decide to walk away again." This entry was posted in National Security and tagged Iran, John Kerry, Nuclear Weapons, Obama Administration, Sanctions. Bookmark the permalink.